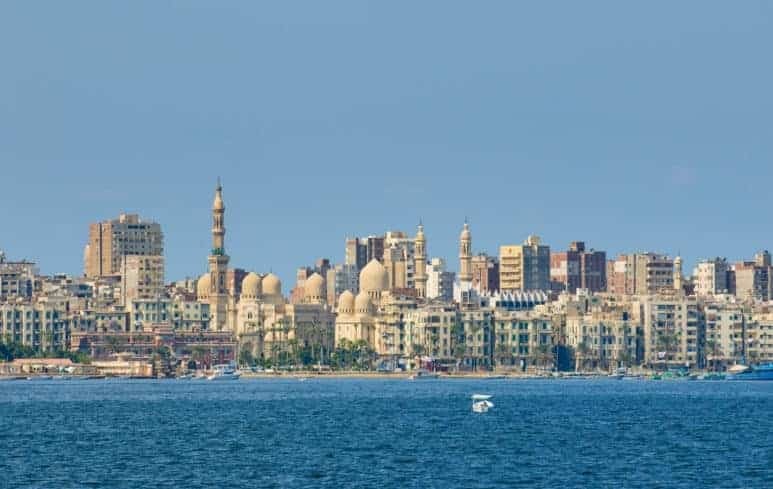 There are so many historical sights in Alexandria so for anybody planning an Egypt trip, an excursion to Alexandria should be high on the list. 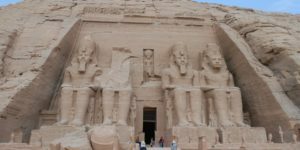 This ancient Egyptian capital, built by and named after Alexander the Great, has so many stunning historic sights that planning an itinerary can feel overwhelming. But don’t worry – everything is so close together that the city’s main highlights can be packed in one-day trip. So follow in the footsteps of Alexander the Great and Cleopatra as you explore this irresistible city, making time to stop by at least a few of these top sights along the way. Alexandria the Great traveled all over Egypt and visited Luxor, Aswan, Valley of the Kings, Valley of the Queens, and Giza as well. 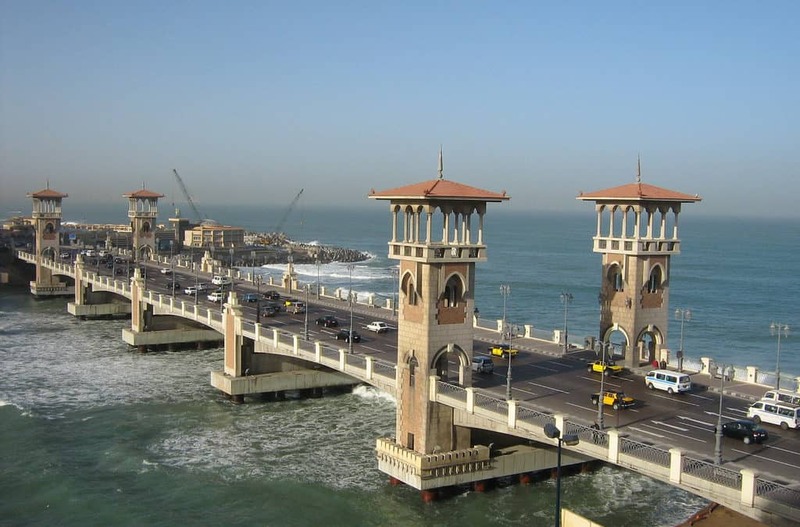 Alexandria’s distinctive look is partly down to its blending of Greco-Roman architecture with typical Egyptian elements. You can see this distinctive mix of styles at its most pronounced at the incredible Catacombs of Kom el-Shoqafa, a headline stop on many Egypt guided tours. Built directly into the face of a hill in the Carmous area, these ancient underground wonders are an engineering marvel. Believed to have been built close to 2,000 years ago, the catacombs lay hidden for many centuries, before finally being uncovered in 1900. Who, you might wonder, made such an important discovery? The answer: a passing donkey, who was unlucky enough to fall in. Take the more sensible route down by descending the spiral staircase and you’ll discover a network of beautifully-carved burial spaces. The tunnels are deeply atmospheric and more than a little eerie, even without the hundreds of mummified bodies which once rested here. 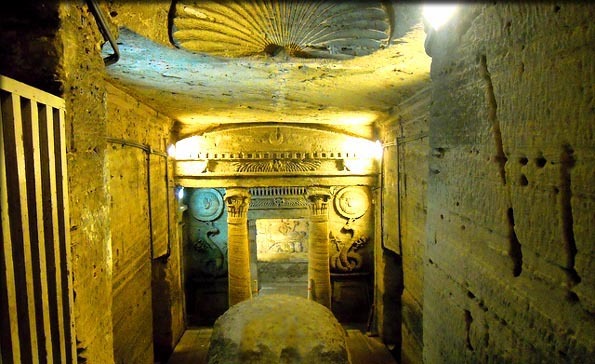 The catacombs are far from alone in offering a window into Alexandria’s past. 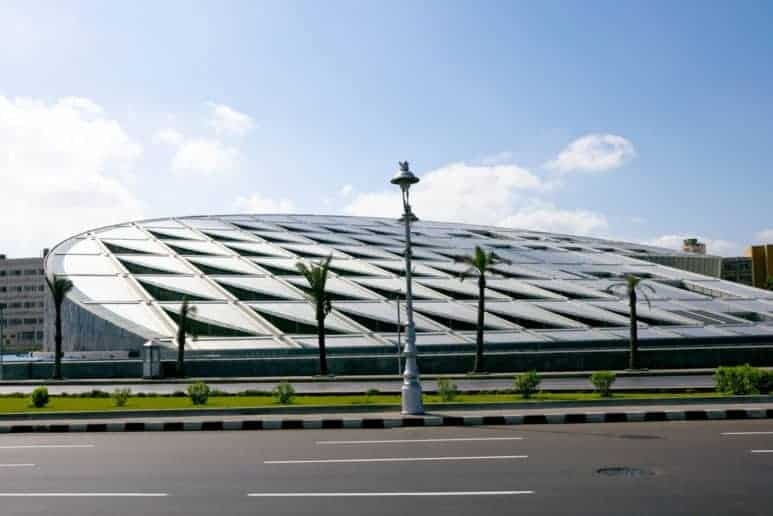 Another one of the city’s most famous sights, the Bibliotheca Alexandrina, is also firmly rooted in history. 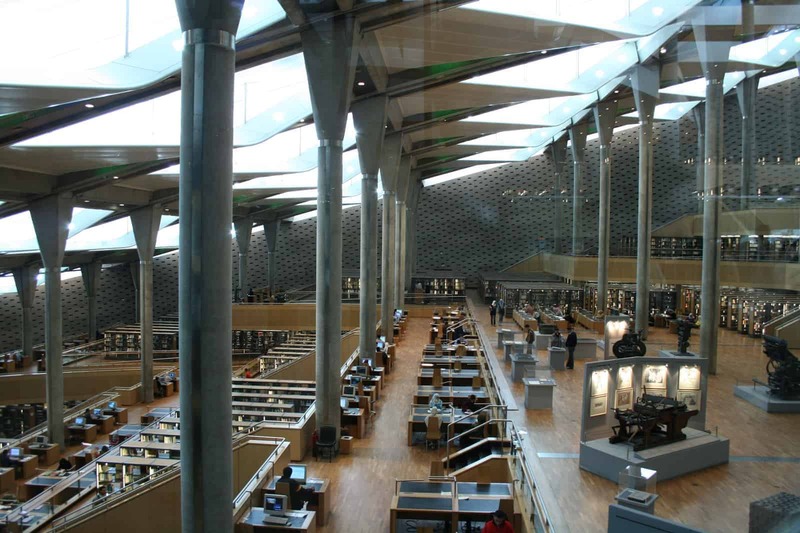 This library isn’t antiquated – it’s housed in a modern building constructed in 2002 – but was built to pay homage to the legendary Royal Library of Alexandria. This original library, a hub of classical learning that features heavily in myth and legend, was built in the 3rd century BC. 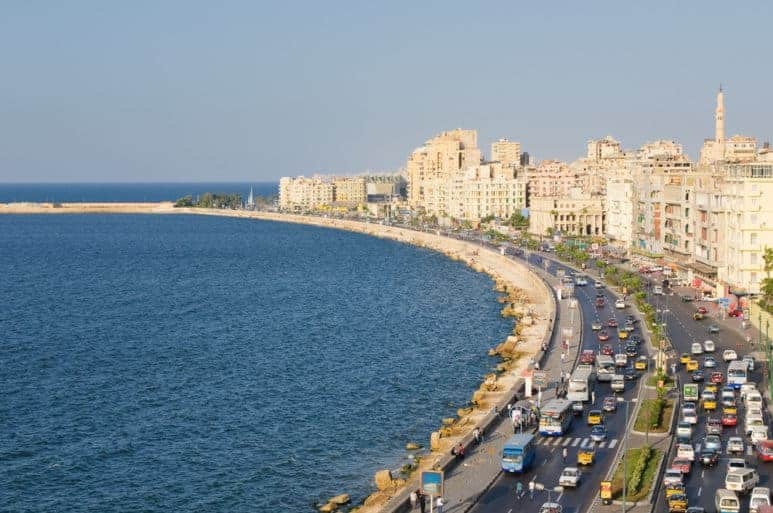 The vast circular form of the current building dominates Alexandria’s Corniche. Inside, you can browse millions of books, visit rotating exhibitions, and discover ancient texts in the Manuscript Museum and historic artifacts in the Antiquities Museum. You can even take a trip to the stars, courtesy of the Science Museum and Planetarium. It’s a true highlight of any Egypt trip. Take in beautiful views of the Mediterranean Sea from the top of this historic fortress. Although it’s been restored and rebuilt many times over the years, parts of the building date back to 1480, making this yet another centuries-old treasure in a city blessed with many. The citadel stands on the foundations of another iconic structure, the Pharos Lighthouse. This was one of the seven wonders of the ancient world until an earthquake brought it down in 1303. 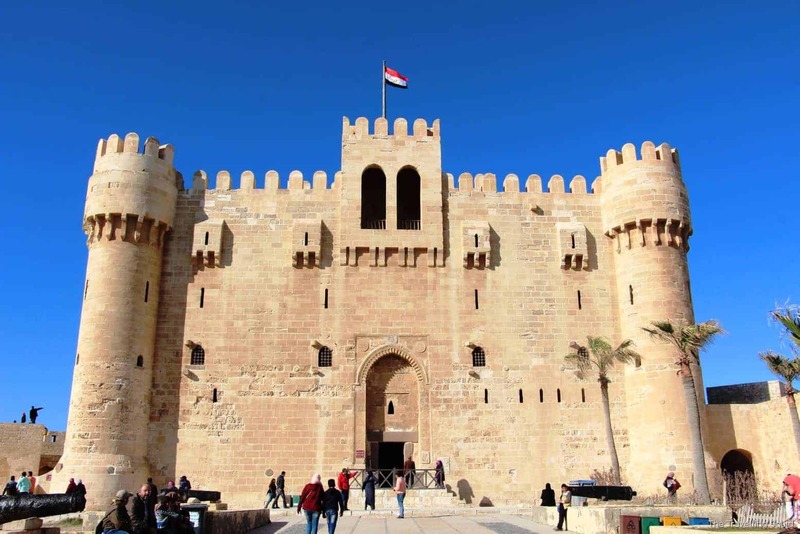 Get to the citadel by foot if you can, as the walk along the Corniche waterfront area is a treat in itself – and one of the highlights of any Egypt vacation. Running for more than 10 miles, this waterfront promenade is one of the busiest stretches anywhere in Alexandria. The Corniche is bookended by two of the city’s most renowned attractions: the Citadel of Qaitbay to the west, and Montaza Palace to the east (more on that shortly). At various points along the Corniche’s length you’ll encounter grand 19th and 20th-century buildings, relics of the city’s bygone colonial era. Look out for the Cecil Hotel, where Winston Churchill once stayed. 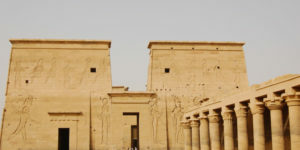 Many Egypt tours will also give you a chance to spend a night here yourself, as it’s still operating as a hotel. Alexandria’s streets can get pretty hectic, but when you feel like a break, a simple solution is on hand. 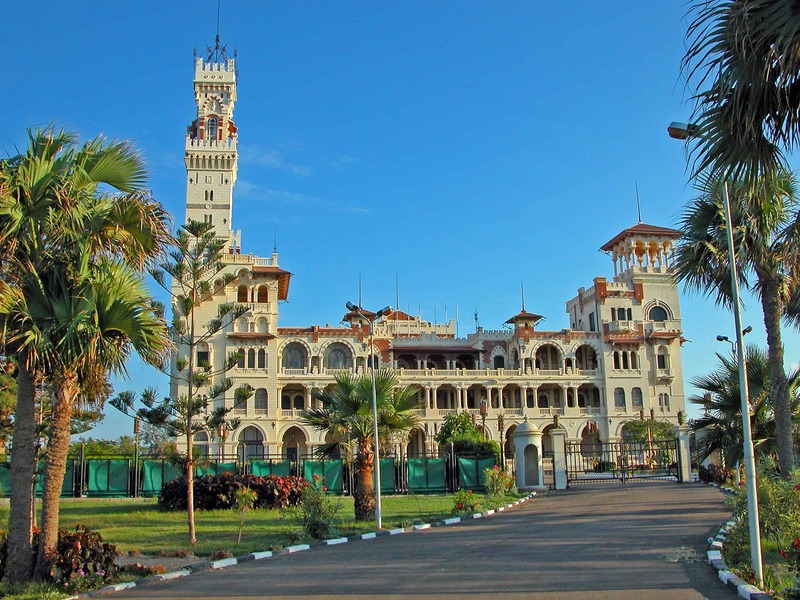 Just head to Montazah Palace, an elaborate building constructed in the 19th century as a royal hunting lodge. You can’t go inside, but the gardens that surround the building are the perfect place to unwind. These well-maintained grounds remain every bit as manicured now as in the days when they were reserved for the nobility. Leave the bustling city streets far behind you as you wander amid brightly-colored flowerbeds, read in the shade of a swaying palm, or even bathe on a tiny beach. Seeing Alexandria’s many historic sites in person is a rare privilege and a wonderful experience. However, if you want to truly get a handle on where they fit into the city’s past and present, it’s well worth paying a visit to the Alexandria National Museum. 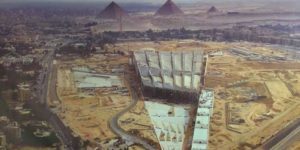 Start in the basement, which covers the Pharaonic era, and work your way upward through the days of Alexander the Great, followed by the Byzantine and Islamic periods. See ancient items uncovered on archaeological digs all around the city and learn how Alexandria has changed over the centuries. For a truly authentic experience, make your way to the west of Tahrir Square, where you’ll discover Alexandria’s sprawling main souq. This enormous market is targeted squarely at locals, rather than at tourists – but that’s where its charm lies. Get lost in the twists and turns of lanes lined with stalls selling everything from trinkets to spices to household goods. 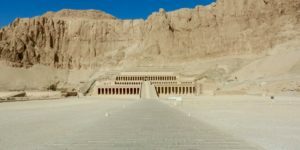 This is the ideal place to pick up some unique souvenirs of your Egypt custom tour, but remember: if something catches your eye, you need to be prepared to bargain. 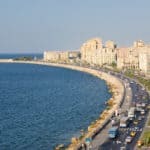 The list above is just a snapshot of all that Alexandria has to offer, and as with any major city, the best way to get a sense of the unique character of this historic place is to visit it. 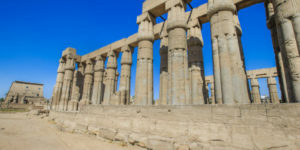 Many Egypt tour packages that take in Alexandria will also take in highlights not mentioned here. You might end up visiting historic sites including Ras El Tin Palace, Pompey’s Pillar, the Roman Amphitheater, and the Abu al-Abbas al-Mursi Mosque, as well as specialized museums such as the splendid Royal Jewelry Museum. Wherever your Alexandria adventure takes you, the time to make it happen is now – so start planning your Egypt private tour today, and we’ll see you there! Mahmoud is the owner and operator of Osiris Tours. Osiris Tours offers custom private guided tours to Egypt, Morocco, Turkey, Jordan, Dubai, and more. The flexibility of Osiris’s offerings result in custom-made journeys that are designed carefully to deliver personalized and different travel experience like no other company. Enter your email and subscribe to Osiris Tours and get all the latest Travel News and Deals for the Middle East and Africa. 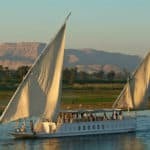 Is Egypt Safe for Americans to Travel to in 2019? "Osiris tours will keep you safe, and will fuel a love affair with Jordan and Egypt to last a lifetime." Absolutely impressed with Osiris services from booking to the splendors of Egypt!!! 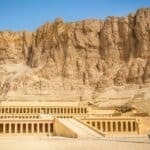 Stop looking and choose Osiris Tours - Egypt at its best!